The Jeanneau Sun Odyssey 40DS is a spacious family cruiser, easily sailed with in-mast furling main and furling headsail giving surprisingly good, effortlessly fast performance. 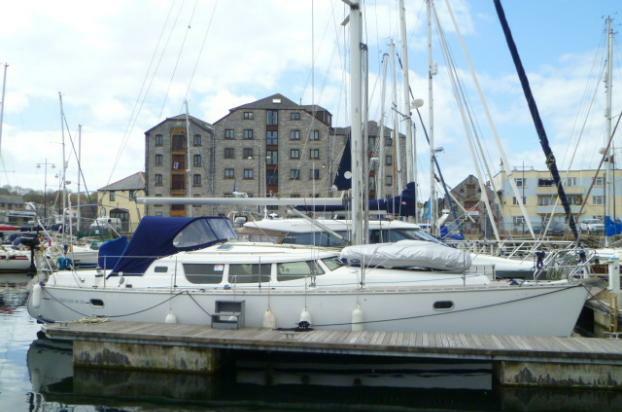 She has a roomy layout for comfortable living below featuring a large main saloon with excellent outside visibility when sailing or in harbour. 'Driftwood' has had just one owner from new in 2001, and has the more powerful 56hp Yanmar engine option, and the shallow 1.5m fin keel. Aluminium alloy In-Mast furling mast and boom. Six berths in three separate double cabins, plus convertible berth in the saloon creating an additional double berth. additional opening portlights in forward saloon screen. Nav area: Port side navigation position with two single seats. Galley: 'L' shaped galley with two burner gas stove with oven, Large Top opening fridge, hot and cold pressurised water system. Ample Storage. Two Aft Cabins: Port aft cabin has a generous double berth extending over the centre-line, large hanging and shelved locker to port. Aft Heads: Port side heads compartment with sea toilet and shower. Eberspacher warm air heating with outlets to all cabins. 7 Day heating controller. Teak and holly cabin flooring.